Asus has unveiled a new 32 inch Asus curved monitor at this years Computex, the monitor is a prototype at the moment, and it measures 32 inches and has a Quad HD resolution. The 32 inch display on this new Asus curved monitor has a resolution of 2560 x 1440 pixels, it also comes with a 16:9 aspect ratio, and it comes with a DisplayPort and features a 250cd/m2 m2 brightness. So far those are the only specifications available on this new Asus curved monitor, as yet there are no details on when Asus will launch the device. We have seen various curved displays recently, LG and Samsung launched smartphones with curved displays, and a number of TV manufacturers have also launch curved OLED TVs, which include LG and Samsung, and various other manufacturers are also releasing curved TVs. 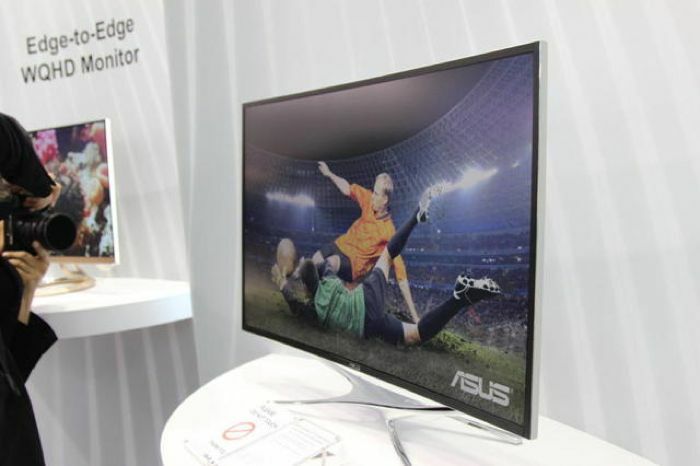 We can expect this new curved monitor from Asus to feature a relatively high price tag when it launches, as the latest curved TVs tend to be some of the more expensive models available. As soon as we get some more information on this new 32 inch curved monitor from Asus, including a launch date and some pricing we will let you guys know.